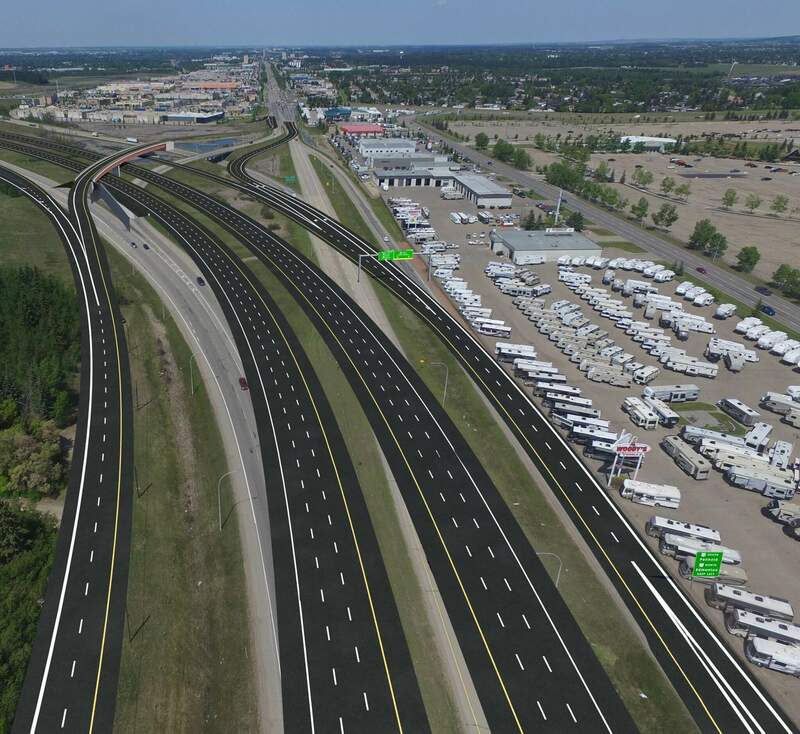 Flatiron Constructors Canada secured a $79.8 million contract to construct a new interchange at Queen Elizabeth II Highway and Gaetz Avenue in Red Deer, Alberta. In July 2016, Alberta Transportation awarded the design bid-build contract to Flatiron. There were 14 bidding teams. Preconstruction activities began in August 2016 and construction officially broke ground in September 2016. The project area is along Highway 2, between the City of Red Deer and Gasoline Alley. The project limits are narrow, with limited storage space and it also requires high speed to be maintained on the high volume Highway 2. The project will reconstruct the interchanges of Queen Elizabeth II Highway at Gaetz Avenue and Taylor Drive and includes the removal of three bridges, construction of five new bridges, reconfiguration of ramps and intersections, realignment of the highway and expansion to six lanes, and the construction of new collector-distributor roads. This new traffic configuration with new bridges improves safety for the travelling public. Previously, traffic merged into fast lanes and substandard curves, as well as contending with inadequate lighting infrastructure. Maintaining traffic control is a project challenge. With average annual daily traffic volumes of 84,560 vehicles on the major roadways, restricted lane closure hours and minimum posted speeds are specified by the contract and limit construction operations. Flatiron worked closely with their traffic consultant to develop a comprehensive traffic accommodation plan which specifies phasing, detailed detour designs, site access, and restrictions that are communicated and enforced by crews, as well as subcontractors. Flatiron also implemented alternative sequencing and worked closely with local stakeholders to ensure road closures and detours are acceptable. The project required flexibility, including night work to meet construction commitments. Red Deer is hosting the 2019 Canada Winter Games and the new interchange is targeted to be ready in advance of the games. The new corridor will provide improved safety and efficiency for increased traffic flows.